Beschrijving: Soft, elegant sparkling wine with a mineral backbone made by an artisan producer with vineyards on the sunny, well-drained, steep slopes of the classic production zone above Valdobbiadene. 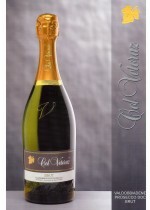 Prosecco is a late ripening varietal grown only in a small corner of the Veneto. Perfect as an aperitif before a holiday meal, with dry cookies or cakes, or at a casual celebration with family and friends.